You Can't Be Too Purple! I took the sketch from Sweet Stop, except I used an oval frame instead of a circle. 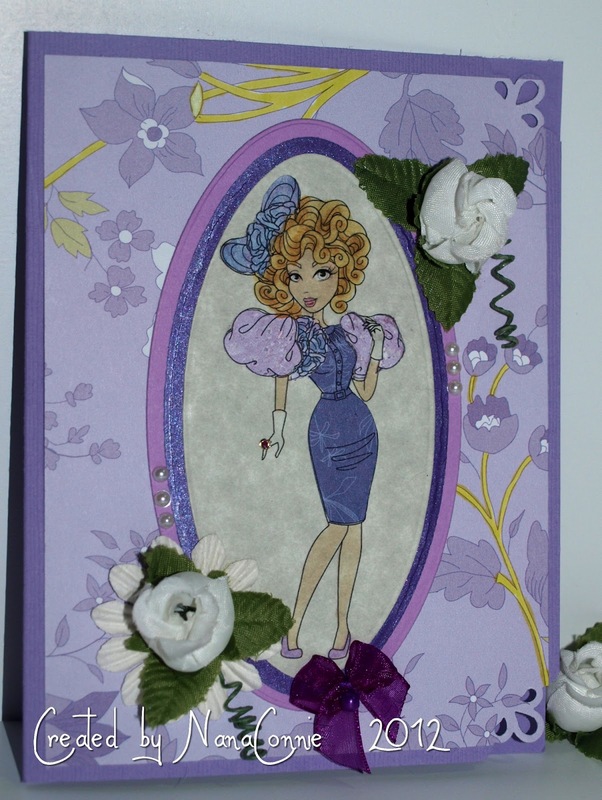 "Effie Trinket" is a freebie at the Sassy Studio Designs group at Paper Craft Planet where they want us to use the freebie and help them celebrate 600 members. They also want to see Embossing, Flowers, Full of color, Ink, and Embellishments (EFFIE). Effie's hair and skin are colored with alcohol ink markers, and her dress and hat are completely paper pieced with 3 different dps. The flowery background dp was in my stash and I have no idea who made it. I used an oval die to cut the image plus two larger sizes for framing, a total of 3 layers on the image. The dark frame is metallic paper which has been embossed. The card base has also been embossed with a CB "Linen" folder. All the embellishments, including the ribbon for the bow, were in my stash. I punched the corners with a decorative punch and added three pearls to each side of the frame. The digi is colored with Copics markers, and the plaid paper is from Bearly Mine. The pink striped paper is from SU. I added only cord and rhinestones (which have been in my stash forever or maybe longer!) because I wanted another CAS card, which I'll put in the box for Operation Write Home. It's almost full and ready to send off. If you don't know about OWH, click on their badge on the right side of my blog and read about them. 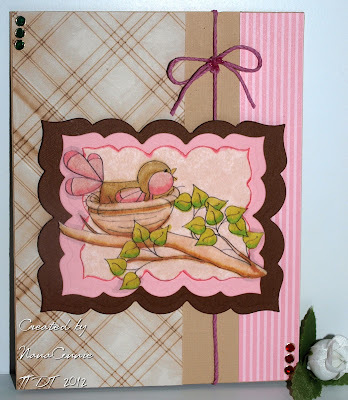 A fantastic organization which can always use more cardmakers willing to make and donate cards for our troops to use to stay in touch with loved ones at home. Won't you come play with us at Tuesday Throwdown this week? Take a look around you garden and then check out your stamps and supplies, and let your imagination run. We want to see what's in your garden this wee!